The Refiner's Fire Blog: This is why we at The Refiner’s Fire are into Messianic Apologetics! This is why we at The Refiner’s Fire are into Messianic Apologetics! We never cease to be amazed over the arrogance of counter-missionaries (those who have rejected Yeshua as Messiah and are busy bashing him every chance they get)! 1. God created the entire universe and everything in it, including man whom He made from the dust of earth. 2. God flooded the earth, killing everybody except Noah and his family – who started mankind all over again. 3. God sent ten plagues who show Pharoah who was boss; and then he caused the sea to part, allowing only the Israelites to pass through, while basically wiping out all the Egyptians who followed in hot pursuit. 4. God supernaturally clothed and fed six million people wandering in the wilderness for 40 years – all while leading them via pillars of cloud and fire. How was THAT possible? 6. Elijah ran faster than a chariot and was fed by Ravens. How was that kosher? 7. Jonah spend the night in a whale’s stomach and lived. Surely, you get the gist…. 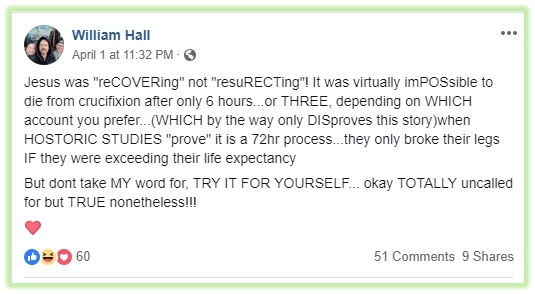 But, please don't patronize us by trying to suggest that you KNOW those things are true because "they were passed down to you by the Rabbis and sages!" Sorry, but that doesn't hold water! The Rabbis and sages were mere men who - like YOU - weren't personally present at Mt. Sinai, so ALL we really have is FAITH and hearsay! Notice, I said FAITH? That's what believers in Yeshua have! 50. Then again Y’shua cried out with a loud voice and gave up his spirit. 51. And immediately, the curtains at the door of the temple were torn in two from the top to the bottom. And the earth was shaken and the rocks were split. Y’shua was not necessarily quoting Psalm 22, although the imagery of the Psalm is certainly intended by Matthew. Greek is transliterated Eli, Eli lama sabacthani, but Peshitta and Psalm 22 read: Eli, Eli lama azbatani. Many Bibles read “forsaken” from which came a false teaching that the Father left Y’shua destitute (Marcionite thinking). Isaiah 53:4 indicates that “we” reckoned him smitten of Elohim, but it is not YHWH who tortured His own son, but men motivated by religious tradition. Psalm 22 references those who scorned Y’shua for his Faith in YHWH and called him a worm (detested), but Father YHWH does not forsake the righteous, nor does He at any time “forsake” His own Son – see Psalm 9:9, 10; 37:25; 71:11; Isaiah 49:14-16. Y'shua says "Eli" (my El). He is in great physical pain after being brutally tortured; those around him were confused about whether he was saying "Eli-yah" or "Eliyahu". If Hebrew eyewitnesses were not sure of what he was saying, it shouldn’t be a surprise that Greek transliteration was also wrong, putting "lama sabacthani" rather than "lemana shabakthani". Perhaps the reason Y’shua says "why are you sparing me" is because he has proven his commitment by laying down his life and has already endured about six hours of the execution! So, it’s not a matter of being "forsaken" but that he literally means, "Father, I'm ready, why can’t we finish this?" In a matter of moments from saying this, he dies, which fully supports this interpretation. Being “Set Apart” unto YHWH, means to be led by the Ruach haKodesh to keep the Commandments of YHWH. Belief in itself does not make one Set Apart; even the demons “believe” in YHWH and His Mashiyach (Ya’akov [James] 2:19).